TEXLINE, Texas – Tucked inside the New Mexico-Texas state line, just 10 miles from Clayton, N.M., is the home of Jean and Guy Winters. It’s there that they have raised and educated their two sons, Pecos, 17, and Brazos, 15. It’s where they have focused their lives on the basics: Faith, love and family. You see, Jean Winters is a woman of great faith –in God, then in everything else. The family has been involved in rodeo all their married lives. In fact, Guy and Jean spent the first few days of their honeymoon at a rodeo in northeast Colorado, where Guy was working as a pickup man. They owned a livestock production company for about 15 years, with Guy running the show. They prayed, focused on their faith and made the decision. “We felt like we were there for a reason, and our season was ending, so we sold most of the rest of our stock,” she said. Rodeo isn’t the most stable of businesses, whether it’s in production and owning bucking stock or racing a fast horse around the cloverleaf barrel pattern. That’s where the Winters’ faith pulls them through all the challenges and doubts that come the way of the rodeo trail. She’s had that purpose all her life. Her mother and father taught Jean the power of God’s strength, and she believed it. From a little girl, when she worked to train her Shetland pony, there was a hunger. “God put this drive in my heart, and I didn’t know what it was until later in life,” she said. 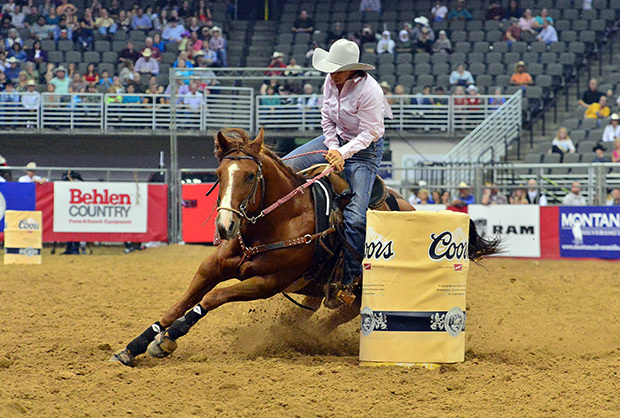 Winters secured her first invitation to ProRodeo’s grand championship in early July, when she won the barrel racing title at the Calgary (Alberta) Stampede. Just like everything else in rodeo, it didn’t come easy. Winters competed in three preliminary go-rounds without success and failed to advance to the semifinals. Instead, she and the others tried to secure their place in the final day of competition through the wild card round, in which only the top two contestants advanced. Winters finished second in the wild card to qualify for the semifinals, where she finished third – the top four in the semis advanced to the finals. That’s where Winters and her 11-year-old sorrel gelding, Crickets Peppy Zan, scored the best. They rounded the cloverleaf pattern in 17.40 seconds, one of the fastest times in the 10-day championship, and earned the $100,000 first-place prize – only half that counted toward qualifications for the NFR. “I am just so very thankful for Calgary,” said Winters, who earned the right to compete at the Stampede by finishing well in the Women’s Professional Rodeo Association’s inaugural qualifying tour in 2012. “I’m thankful I had the opportunity to go to Calgary because, all in all, my season was not very good. I would go to rodeos and not place at all. At San Antonio, I did well, then I went to Houston and could not win a dime. I’d finish just one hole out of the money at more rodeos than I care to remember. But the year was brilliant in that Winters shared time with Zan, a horse she has ridden for seven years and has owned for four. “I just had a gut feeling the horse would work good,” she said, noting that he’s just 14.1 hands tall. “He is quick. He can get somewhere fast. He has a gritty attitude. You couldn’t wear him out. So t how did she overcome the roller coaster that is the rodeo trail? It’s what works for Jean Winters. Her faith has carried her a long ways this season … all the way to Las Vegas and ProRodeo’s championship event.